It’s coming down to the wire folks! The packers will be arriving in 2 days, thus starting the Lombardo family’s next big adventure: Mt Home Air Force Base, Idaho! This weekend, as we prepped the patio furniture and pizza oven, I stopped so I could keep a promise to a promising young lady ~ Bri and her lovely family have been a source of smiles and companionship for the time we’ve been in Texas… Happy Birthday, Bri ~ hope you were as delighted with your meal, as we have been with your family’s friendship! 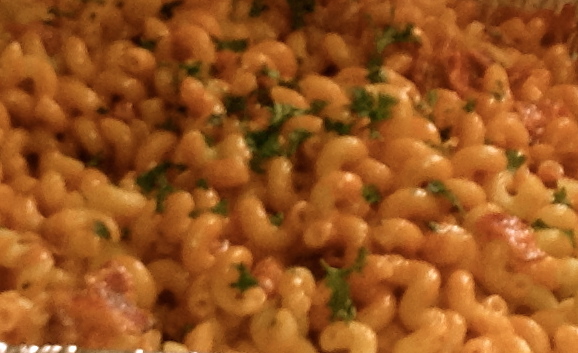 Cook pasta in a large pot of salted water; in a large skillet, melt butter; add bacon and garlic, allow to simmer 2 minutes; add tomato paste, parsley, crushed red pepper, salt and pepper, stirring until paste breaks down (about 2 minutes); add vodka and cream to tomato mixture, stir until well blended; allow to simmer on low heat for 6-10 minutes. Taste for season correctness, adding salt if needed (remember, your pasta should be well seasoned with salt, so don’t be too heavy handed with it in the sauce, but you do want to season each part individually; both pasta and sauce should taste just right on their own before you marry the flavors!). Drain pasta, tip gently into skillet with sauce; toss gently, then tip into serving bowl.